Part of the Joseph Black Chemistry Department buildings on University Place, viewed from University Avenue. Category A Listed Link . Joseph Black FRSE FRCPE FPSG (16 April 1728 – 6 December 1799) was a Scottish physician and chemist, best known for his discoveries of magnesium, latent heat, specific heat, and carbon dioxide. Black was Professor of Anatomy and Chemistry at the University of Glasgow for 10 years from 1756, and was later Professor of Medicine and Chemistry at the University of Edinburgh from 1766, where he remaind in a teaching and lecturing capacity for more than 30 years. The chemistry buildings at both Universities are named after Black. This article refers only to the Glasgow building. The three linked buildings were designed by Scottish architect T. Harold Hughes Link . The design for the 'Chemistry Institute' included four linked buildings which were to house Organic Chemistry, Medical Chemistry, Physical Chemistry and Inorganic Chemistry. The high cost of materials and labour due to the introduction of the National Rearmament Programme of 1936 resulted in the most expensive of the buildings (Inorganic Chemistry) being dropped from the plans. Due to the outbreak of the second World War, only two of the three blocks were completed by 1939; the south-eastern block housed the Organic Chemistry department and the central block housed Medical Chemistry, Physical Chemistry and Inorganic Chemistry. The north-western block was completed between 1946 and 1954 to a design by David Stark Reid Waugh. Inorganic Chemistry moved to this building. The entire complex was not officially opened until 1954 and was not named after Joseph Black until as recently as 1997. The low-relief portrait memorial of Joseph Black on University Place was sculpted by Benno Schotz Link in 1953. 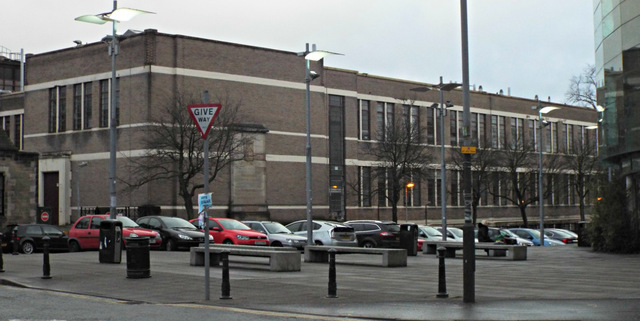 The building is Category A Listed Link and is one of only 51 post WWII building in Scotland to achieve this status Link . "The design is a hybrid of contemporary styles part monumental classicism, with its near-symmetrical layout, stylised classical details and special slim 'Roman' bricks and part 'Art Moderne' in its horizontal emphasis, flat roofs, butterfly plan, reinforced concrete structure, lying-pane metal windows, projecting glazed staircases, and zig-zag jazz railings. The manufacturers of the Buckingham Palace gates of 1911, Bromsgrove Guild Ltd, produced the distinctive bronze lettering over the entrances. An incised frieze depicting animals runs along the southern range, which was reputedly added to placate Edward Hindle, Professor of Zoology, who had lost his open views to the north due to the construction of the Chemistry Institute."